The Force Trainer For All You Wannabe Jedis | OhGizmo! The Force Trainer from Uncle Milton Industries uses the same concepts and principles as the Mindflex game that Mattel was demoing at CES this year. 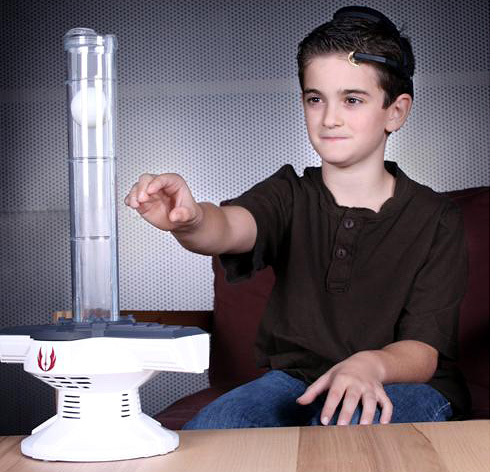 The Jedi-in-training wears a simple wireless headset that measures their EEG brainwave activity, which in turn causes a ball inside the 10-inch “training tower” to rise or fall. So no midichlorians needed here. Like with the Mindflex game, you’ll need to concentrate on something in order to activate the trainer and manipulate the ball, though it seems to me like you could be easily distracted by the Star Wars sound effects and audio clips that will let you know how you’re progressing from a lowly Padawan to a Jedi Master. The Force Trainer is expected to be in stores this Fall, and will set you back about 90 to 100 republic credits. Heh, that kid looks like such a tool. Interesting… that kid looks like a very young Wil Wheaton. Which only makes it better. That's a nice gadget for kids, I'm sure kids will love it. wow that looks pretty crazy. That's a nice toy, children will surely love it.